The students’ project is the university’s entry in iGEM, the International Genetically Engineered Machine competition. After a regional judging earlier this month, the undergraduates’ project, called VitaYeast, has advanced to the iGEM finals, scheduled for Nov. 5-7 at the Massachusetts Institute of Technology. In the annual iGEM contest, students from around the world present projects based on synthetic biology, a burgeoning field in which researchers manipulate small bits of DNA and other biological material to make cells carry out new tasks. The Johns Hopkins participants say that no matter what happens at the iGEM finals, they will continue to tout their enhanced bread as a relatively simple way to help hundreds of thousands of people who are suffering from malnutrition. 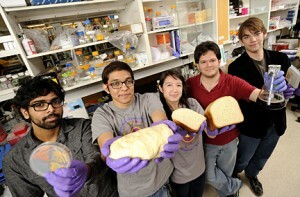 Displaying their VitaYeast bread, from left, are Johns Hopkins undergrads Ashan Veerakumar, Arjun Khakhar, Steffi Liu, Daniel Wolozny and Noah Young. Photo by Will Kirk/Homewoodphoto.jhu.edu . To curb global malnutrition, Arjun and his teammates envisioned an enhanced starter dough that could be shared easily and cheaply among large groups of impoverished people. The bread baked from this dough could avert health problems that occur when vitamins and other nutrients are missing from their diets. Such health problems can be serious. The World Health Organization has described vitamin A deficiency as the leading cause of preventable blindness in children. In campus labs, the students developed a genetically engineered yeast to add vitamin A to the diets of malnourished people. Photo by Will Kirk/Homewoodphoto.jhu.edu . 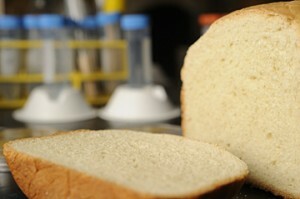 Yeast, which helps make bread rise, does not normally produce vitamins. To make this happen, the students, representing a variety of science majors, had to genetically tweak the single-cell microbes. The team members figured out how to add to yeast cells certain DNA sequences that triggered a series of biochemical reactions that produced beta carotene. They presented that development at the iGEM regional contest and are continuing to work on yeast that also produces Vitamin C, another crucial nutrient needed in impoverished areas. Although it looks and smells like regular bread, VitaYeast loaves are designed to deliver extra nutrients needed to address global health problems. Photo by Will Kirk/Homewoodphoto.jhu.edu . Because the lab bread contains a genetically engineered ingredient that has not undergone safety testing or received approval from government regulators, the students are not permitted to eat it. But they are encouraged by the tempting aroma and traditional breadlike texture and appearance. He and some of the other team members are also looking for outside funding to continue pushing the VitaYeast project forward. Yet before VitaYeast bread can make its way to malnourished people, it must overcome many hurdles, including animal testing and rigorous regulatory reviews. An online video about this project can be viewed at http://www.youtube.com/watch?v=4mqoS1xfTW8 . Digital color images of the student team available; contact Phil Sneiderman. Johns Hopkins Department of Biomedical Engineering: http://www.bme.jhu.edu . Video interviews and color digital images of the student inventors are available; contact Phil Sneiderman.